JOIN US FOR AN INCREDIBLY EXCITING OPPORTUNITY! With no prior paragliding experience, you can soar over beautiful Lake Tahoe with a professional USHPA Certified Tandem Instructor. After a quick gear orientation and brief pre-flight instruction, you will be soaring above Lake Tahoe, as passenger, on a breathtaking and unforgettable experience. Spread your wings with professional instruction from the only USHPA Certified Advanced Instructor in Lake Tahoe, offering both paragliding and speed-flying courses. Is there a certain age I have to be to fly? No, but if you are under 18, we will need to have a adult guardian fill out the paperwork. People of all ages enjoy the freedom of flying tandem, from one year old, to eighty-one years old. Do I have to be physically fit to fly tandem? During take off and landings, you may be required to run, so you may not have to be a marathon runner, but some physical fitness is required. If you can take a few running steps, then you will be fine to take a tandem flight. With a tandem paraglider, it takes the cooperation of the passenger and pilot to take off. During flight, the passenger will be asked to help steer the paraglider by leaning left or right—similar to riding passenger on a motorcycle. Is there a weight restriction for the passenger? Yes. The passenger must weigh over 60lbs and under 215lbs. This is because we must adhere to the certified load rating of our tandem glider, both for safety and performance. How do we launch or take off? We will both be hooked into the glider, passenger out front, pilot in rear with the glider laid out on the hill behind us in a horseshoe shape. When all the pre-flight checks have been completed and the pilot and passenger are both ready to take off, the pilot will call out 1,2,3 go and pick up the wing. With a couple of steps forward and down the hill, we will be airborne on a soaring flight that will be remembered for the rest of your life. Part of our pre-flight check is teaching you what we need to do to land. Its really very simple. The passenger will get out of his/her seat and listen for the commands of the pilot. We usually touch down like a feather on Kings Beach. Can the passenger fly the paraglider? Yes. This is a instructional tandem flight so we will do everything we can to help you understand the paraglider and how it works. 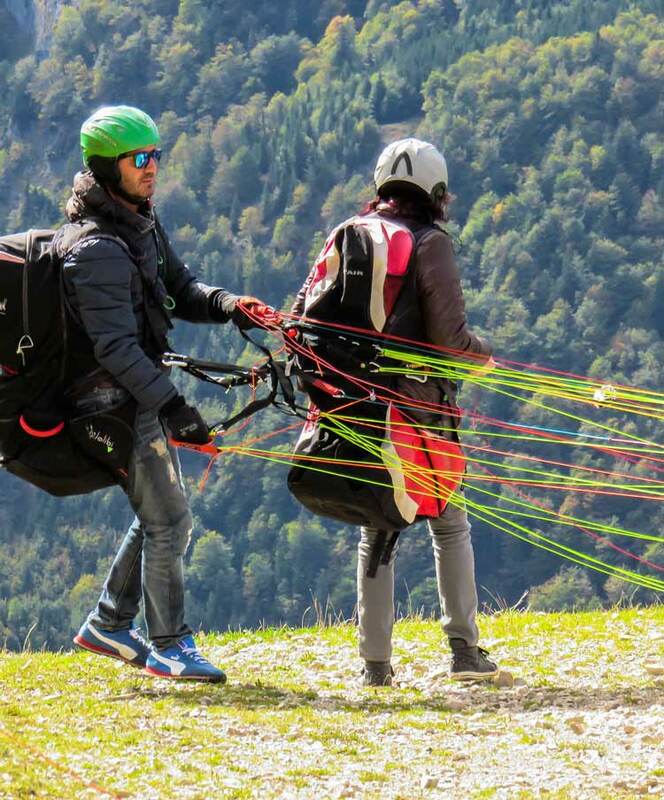 Condition permitting, the passenger can take control of the paraglider and soar the ridge with the security of having a professional Tandem Instructor on-board. The Tandem Instructor will Launch and Land the paraglider, but there is plenty of time for the passenger to fly the glider if he/she wishes to do so. Can we fly every day? No. This is a weather permitting sport. If the winds aren’t cooperating, we wont be able to fly on that particular day. If this is the case, we will either rebook our flight for another day, or you will be given a refund on your money. Can we fly in groups? Absolutely! Lake Tahoe Paragliding has five USHPA Certified Tandem Instructors available to take groups of people flying at the same time. This is a great way to experience this incredible sport. Absolutely! Lake Tahoe Paragliding has five USHPA Certified Tandem Instructors available to take groups of people flying at the same time. This is a great way to experience this incredible sport. We offer group rates! What better present than the gift of soaring like a bird? Visit our store to purchase a gift certificate for an amount of your choice, applicable to both our tandem flights and training school. Joseph and I had a wonderful glide--scenic, excitingly beautiful and fun! Mitch and Jeremy got us both in the air (at last!--Joseph rode for an hour before I got up), and we loved it. We want to go again, thanks to their encouragement. Epic experience! They are professional and I felt completely safe and comfortable the whole time! Mitch and Jeremy were fantastic teachers! An absolutely INCREDIBLE experience with an AWESOME crew at Lake Tahoe Paragliding!